Our local yoga studios are so amazingly on point for what we need this holiday season. 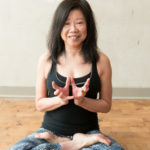 Insight, intention, love, devotion, mindfulness, relaxed alertness, and opportunities to give back – while having a delightful time in downward facing dog. From wine and yoga in Bloomfield with the Powerflow crew to a meditation mini-retreat in Madison, we know you’ll find something that speaks directly to your heart, soul, and yogi toes. And we hope to see you on Saturday in Asbury Park! Bridget and Serena are bringing back the VibeWell LOVE and adding a happy hour cocktail to sweeten the deal – plus they are making a donation to the Boys & Girls Club! Join Madhuri and Krishna for Kirtan with a Bhakti Yoga Discussion! Madhuri and Krishna Sharma are husband and wife who share a deep love of spirituality and devotion. They have been blessed to share in the practice of Kirtan together as well as a wide variety of programs and offerings throughout the country. Madhuri and Krishna maintain and run the Radha Kamalaynaya temple out of their home in Jackson where they open their doors to all seeking a space for meditation and devotion. Who’s ready to mix gratitude and grace with Bridget and Serena again?! They are coming together for an epic afternoon yoga practice at the Asbury Yacht Club on December 1, with a little bubbly (or a Bloody Mary) to follow. There are only 20 spots available for this special event, so book your space NOW. A portion of the proceeds will benefit the Boys and Girls Club. Please join us for this 2-hour interactive Essential Oils Holiday Gift workshop where each participant will have the opportunity to make holiday gifts for all the special people on their lists. Some examples of what we will be making during the workshop: peppermint infused hot cocoa mix, survive the holidays calming roller , sugar scrubs, bath salts, and more! All gifts will be gift wrapped and ready to give to that special someone. Workshop is open to adults and kids ages 6 and up. Come join us while we discuss how to use Natural Solutions for you and your family. Kami, Essential Oil Lover, Energy Healer and Mentor, will be leading our workshop and we will be learning the basics of what Essential Oils are, how to use them, why doTERRA is #1 for quality around the world, and what the best way is to get them into your home. We will be running a raffle and will have goodie bags for those of you who are ready to jumpstart your new lifestyle into natural solutions. Suggested donation of $5 will go to doTERRA’s Healing Hands Foundation. In this yoga workshop, Jayadeva will guide you into opening deeper healing awareness of the 7 main subtle energy “wheels” in the body, the Chakras. By using asanas (postures), visualization, sound, breath you will discover, explore & activate these vital centers of your being. Deepen your yoga practice and learn to bring healing & fullness to your life. Meditation is simple, easy to learn practice that is of tremendous benefit to one’s physical and mental health. It is a wonderful tool for improving the quality of life, enhancing the depth of yoga practice, and increasing happiness and peace of mind. This workshop is a mini-meditation retreat, useful for beginners and experienced meditators. Participants are given instruction in Mindfulness Meditation (Vipassana) and tools for integrating meditation into daily life. You will learn practices that can be used to reduce stress at home, and in your professional life. Participants complete the workshop feeling refreshed and restored, with a new sense of calm, deepened inner peace, and a heightened awareness of – and appreciation for – your life, your relationships, and your surroundings. We will experience several cycles of sitting meditation, walking meditation, and lying-down meditation, periods of “dharma talk,” and questions and answers. We will use our time together to cultivate mindfulness and relaxed alertness in as many aspects of life as possible. Please join Reverend Jaganath Carrera for a stimulating afternoon uncovering the deep truths of the Yoga Sutras in clear, concise, layman’s terms. From the first sixteen sutras, key concepts such as nirodha, vrittis, practice and non-attachment will be discussed. Questions/doubts can be asked. Stories will be told and light shed on deep concepts such as suffering, compassion, and the Light of the Self. Rev. Jaganath will then apply them to today’s world. Please join us for a light filled afternoon. Join Ellen for an exploration of the ancient text, The Bhagavad Gita. Ellen will help deconstruct and interpret this text while applying its lessons to our modern lives. Please be sure to have read The Bhagavad Gita by Stephen Mitchell prior to this workshop and come prepared with questions.